Ever the practical musician, Britten knew what would work in performance. His realisations of ‘The Queen’s Epicedium’ and ‘Fairest isle’ from King Arthur, two of the earliest, dating from the 1940s, are quite frugal, adding little that is not suggested in the original. 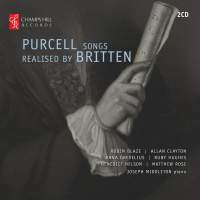 Even the complex harmonies of ‘When Myra sings’ are mostly Purcell’s own. Some of the others, though, undergo full-scale Britten-isation. One of the most extreme is ‘Music for a while’, which adds sound effects for the dropping snakes and the crack of the whips, and ends like overblown Brahms – enough, I have always felt, to set my teeth on edge and send me running back to Purcell’s original. Maybe not any more. The mellifluous Allan Clayton and pianist Joseph Middleton make no apologies for it. The colours they bring to the music are unashamedly Romantic and Middleton, whose vivid playing is a catalyst throughout the disc, lets himself go in Britten’s scene-painting. This seems to me to work better than Graham Johnson’s decorous approach on Hyperion. Similarly, ‘Sweeter than roses’, another of Britten’s more interventionist settings, is lovingly treated by countertenor Robin Blaze. Champs Hill’s six singers are not necessarily preferable to Hyperion’s nine big names – Ruby Hughes’s soprano sometimes feels on the shallow side, Clayton sounds stressed in the trio and Benedict Nelson struggles with the fastmoving ‘I’ll sail upon the dog-star’ – but overall their performances have just as much to offer. The two sopranos, Hughes and Anna Grevelius, are nicely contrasted. Clayton and Nelson play off each other well in their duets. Matthew Rose is outstanding in each of his tracks, authoritative and unfussy. Champs Hill’s recording is also first-rate, giving singers and piano alike tremendous presence. For Purcell, I will still look to period performances. For Britten, this counts as a highly persuasive new release.